My friends drove, in what ironically we referred to at the time as, The Silver Bullet - a 1990 silver Ford Taurus station wagon my friends folks "donated" to the expedition's cause. 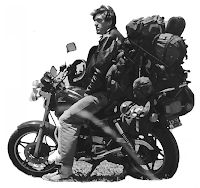 I rode my motorcycle - a 1986 Honda Nighthawk that was just barely capable of carrying my large frame some 16,000 miles around the highest elevations of the country. I had a tent, a sleeping bag, my hiking pack and a guitar all strapped to the bike. I also had a softcover copy of Zen and the Art of Motorcycle Maintenance tucked into my saddle bags. I was ready and willing to receive all the wisdom the road and Mr. Pirsig could throw my way. "The main skill is to keep from getting lost. Since the roads are used only by local people who know them by sight nobody complains if the junctions aren’t posted. And often they aren’t. When they are it’s usually a small sign hiding unobtrusively in the weeds and that’s all. County-road-sign makers seldom tell you twice. If you miss that sign in the weeds that’s your problem, not theirs. Moreover, you discover that the highway maps are often inaccurate about county roads. And from time to time you find your "county road" takes you onto a two-rutter and then a single rutter and then into a pasture and stops, or else it takes you into some farmer’s backyard. So we navigate mostly by dead reckoning, and deduction from what clues we find. I keep a compass in one pocket for overcast days when the sun doesn’t show directions and have the map mounted in a special carrier on top of the gas tank where I can keep track of miles from the last junction and know what to look for. With those tools and a lack of pressure to "get somewhere" it works out fine and we just about have America all to ourselves." I remember with great fondness passages such as these as I was lying under the billion star dome, reading by flashlight and following to some extent my own philosophical and literal journey through the Big Sky landscapes that make up the American west. Most people use AAA as their trusted travel guide and map provider. Luckily, I had Robert Pirsig's penultimate novel on both motorcycle maintenance and the philosophy of quality as my reference manual. "You see things vacationing on a motorcycle in a way that is completely different from any other. In a car you’re always in a compartment, and because you’re used to it you don’t realize that through that car window everything you see is just more TV. You’re a passive observer and it is all moving by you boringly in a frame. On a cycle the frame is gone. You’re completely in contact with it all. You’re in the scene, not just watching it anymore, and the sense of presence is overwhelming. That concrete whizzing by five inches below your foot is the real thing, the same stuff you walk on, it’s right there, so blurred you can’t focus on it, yet you can put your foot down and touch it anytime, and the whole thing, the whole experience, is never removed from immediate consciousness." You sniff around today and the vast majority of investors, traders, S&P analysts, Republican's and Democrat's alike, all see the US through the very pessimistic lens of a diminishing republic on the cusp of insolvency. Some even go further out on the continuum of curmudgeondry - I suppose at this point in the cycle, fear pays better than logic (media speaking). 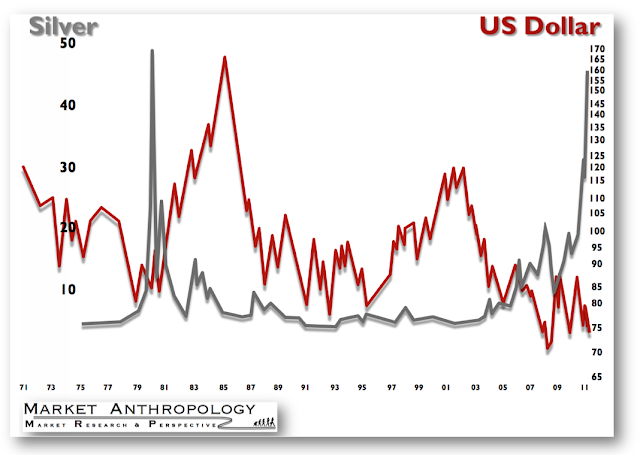 However, if you want real alpha (the preferable meta-alternative to seeking alpha) go against the conventional wisdom here and realize that the US is not insolvent today and arguably headed towards confronting some of the greater fiscal issues that have haunted us for far too long. The general public's perspective is always in the rear view mirror of the market. It is why I follow the market and steer clear of the 24 hour, 12 hour, 4 hour news cycle. I am far too impatient to read about yesterday's news described as if held relevance to today, moreover - tomorrow. The market knows this. The US dollar knows this. The media will eventually catch up with its tail. For all the dollar bears that are waiting on pins and needles for the bottom to fall out or for America to enter into a hyper-inflationary tailspin, just turn their attention to the historic chart of the American currency, post the Nixon Shock in 71'. Where's the doom and gloom? 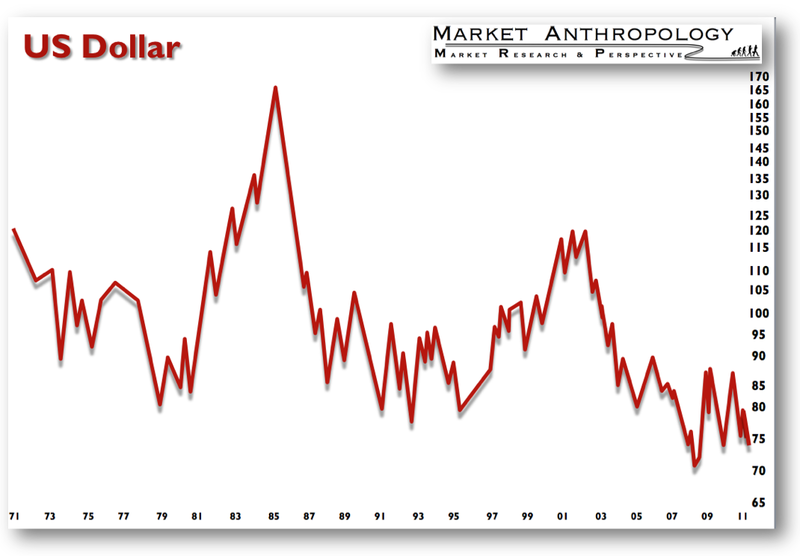 I see a rather normalized trending currency, reflecting moderate fiat debasement, within a technical framework remarkably similar to late 1980 early 1981. And low and behold, silver has very much been acting within the technical part as it did in 1980. This is why I have entered a position that is long the US dollar and short silver. It's not a daytrade, it's a thesis position (I can just feel traders cringe). Similar to John Paulson's trade on housing or Buffet's bet on the dollar - with the caveat that I am expecting a resolution in the market within the short to intermediate time frames. I can only use the previous price history and technical analysis as a reference guide for entering the trade. Realistically speaking, there is a very low probability of picking the absolute top in the silver market. For this reason, I am willing to trade the positions intrinsic value for time. I approach a position in ZSL as an option trade on the silver market, without the serious risk of time decay you are exposed to with conventional options. I do realize that even these trading vehicles have their own inherent component of time decay. However, over the time frames I have described - it is the best fit for me.